In my experience, there is a myth in many organisations that the best leaders take full responsibility and make snap decisions. This may be the best approach for operational decisions when it is important to save lost time. 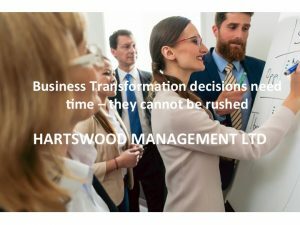 When it comes to Business Transformation programmes, leaders say that they will make instant decisions and the programme leader plans a single workshop or a single day to read and approve a report. This need for speed is unrealistic and unnecessary. Picking an example of a transformation decision, let’s look at the anatomy of how an implementation plan is agreed. Firstly, there is the decision on the sequence of implementation. What are the business criteria for deciding the sequence? Are there operational needs, business benefits, management of change issues, physical or organisational constraints, other competing business priorities etc? There may be diverse views amongst the Senior Leadership Team on these criteria. Secondly, having agreed the criteria, is there a viable implementation route eg a feasible business case and a deliverable implementation plan? Often an organisation will require that a financial investment be approved and this will need to follow an agreed format and approval process. Regarding the implementation plan, an outline plan showing the critical path, timeline, critical resources and dependencies should be approved. Once again, this step may require involved discussion amongst the Senior Leadership Team. Thirdly, once the detail is agreed, it is advisable for the approach to be documented and formally approved, both business documents (eg business case) and programme documents (eg outline plan, implementation plan and programme definition document). If we approach a complex decision of this type assuming that the Senior Leadership Team will make a quick decision from the outset, the decision will stall over the criteria and priorities. If we produce a full report for approval rather than breaking the decision down, the larger issues may not surface until we have spent time correcting the report layout, grammatical errors and flaws in the diagrams etc. It is vital that the programme team spend time with the programme sponsor and CEO planning how the decision is to be made and understanding the preferred presentation approach and method. It is my experience that a minimum of 3 iterations, like the 3 stages described above, will be the minimum number of steps required for any transformation decision. Should we plan for a long decision and it goes quickly we will have more time to deliver. However if we plan for a snap decision and it takes longer, the decision becomes the programme bottleneck and this leads to frustration in the programme team, the Senior Leadership Team and the staff. Consider how your organisation makes complex, leadership decisions. How can this be facilitated as part of the transformation programme? Read Changing Spots – a systems approach to change management for understanding how a senior leadership team should approach leadership decisions (see www.changingspots.co.uk).